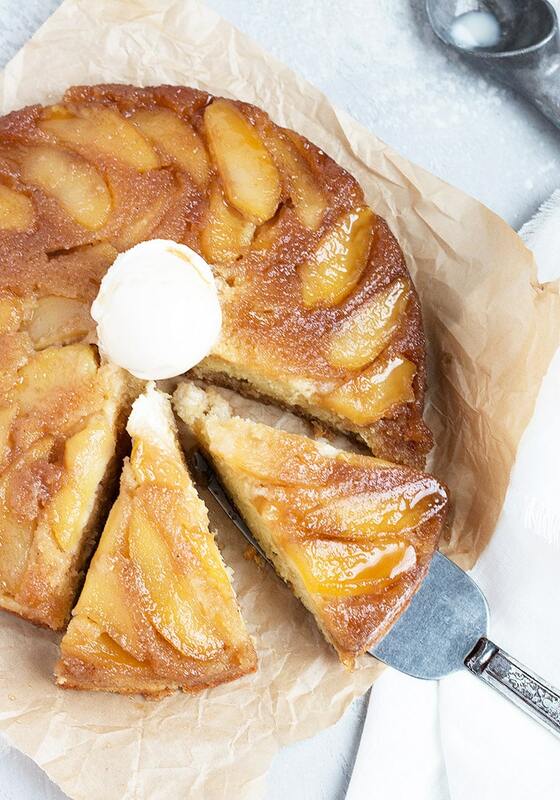 This delicious Upside-Down Maple Apple Cake, tastes just like a stack of warm pancakes! Imagine a big stack of warm pancakes. Imagine they have some cooked apples on top. Now imagine that they have been drizzled with maple syrup, that’s now a little warm and has soaked into the pancakes here and there. Good job. Now you know exactly what this cake tastes like. 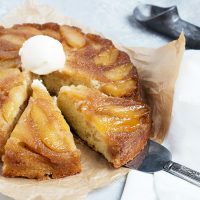 I love that this cake can be made virtually any time, as it’s made with easy, pantry ingredients. And I always seem to have apples around. 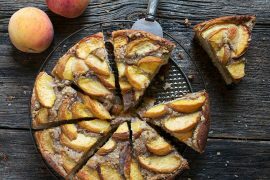 This Maple Apple Cake will make your house smell wonderful for hours. It’s almost worth making just for the smell alone! Thank goodness it tastes as good as it smells. 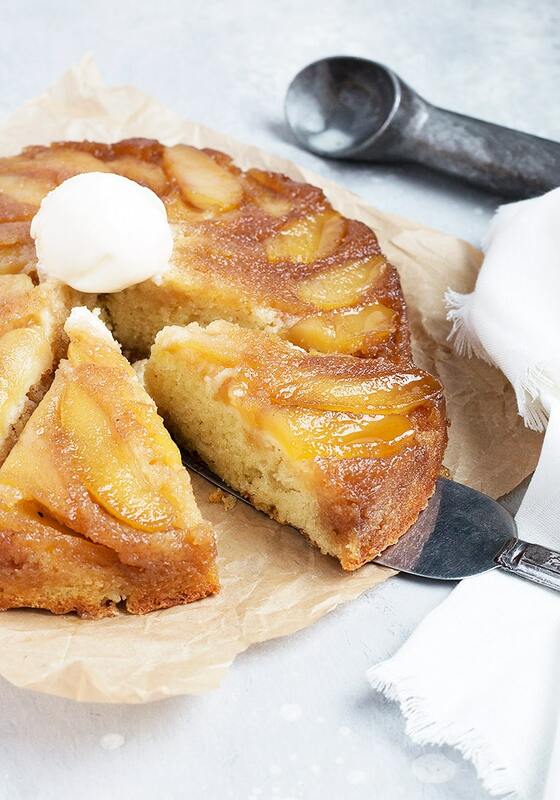 The only tricky part of this great cake is figuring out what to bake it in. If you happen to have a 10-inch round cake pan with 3-inch high sides, you’re all set (skip directly to recipe!). If not, you may want to read on. I don’t have a 10-inch cake pan of any variety. I contemplated using my cast-iron frying pan, but decided against it. In hindsight, I think it probably might have worked with a round of parchment on the bottom of it. Instead, I decided on my 10-inch springform pan. If a springform pan is your only option too, you’ll have to do a little bit of extra work to try and make it reasonably leak-proof. 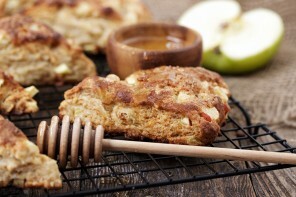 See the instructions in the recipe for some ideas. At the very least, if you bake this cake in a springform pan, be sure to place it on a baking sheet, just in case. I made my cake with Granny Smith apples, even though it’s not usually my apple of choice for cooking. It does hold it’s shape well though, which is nice for this cake. 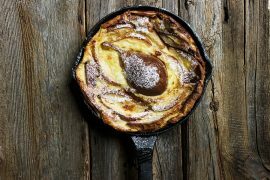 Braeburn, Jonathan or any other apple that holds it shape well when cooked would work here. 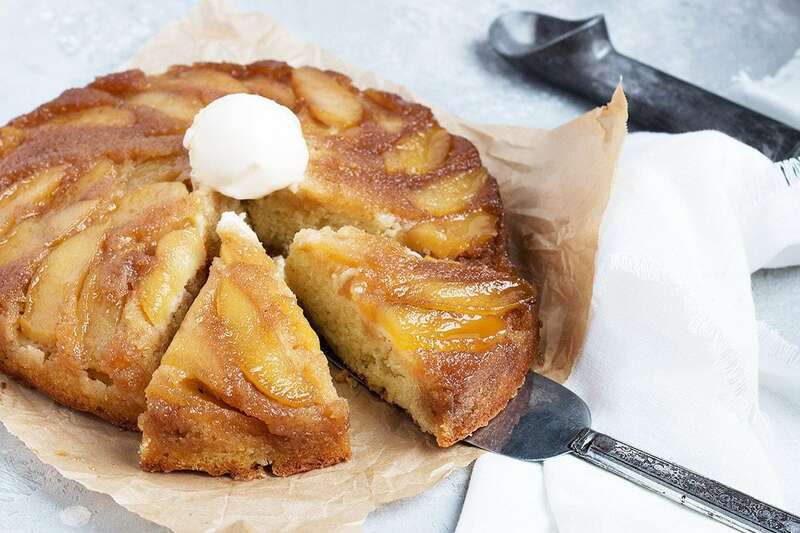 This is a delicious apple and maple syrup cake, baked upside-down and reminiscent of a stack of warm apple pancakes. 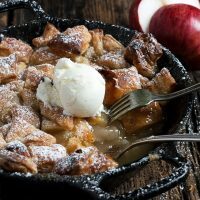 Serve with vanilla ice cream and extra maple syrup. Make your own buttermilk! Mix 3/4 cup regular milk with 2 tsp lemon juice or white vinegar. Let stand 10 minutes and use. Easy and delicious, made with storebought puff pastry! 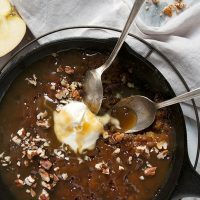 Sticky Toffee pudding made with apples, instead of dates. 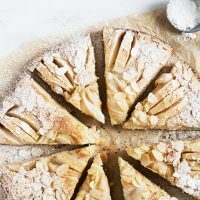 Pretty and delicious apple cake with ground almonds and almonds on top. This cake got rave reviews from family and friends…even had to share the recipe. Very moist and delicious! I thought the same thing, Liz ;) Would be perfect for brunch, as well. This sounds wonderful! Do you think I could pass it off for breakfast?! Hmm, I think so! Oh my! Such a gorgeous cake looks so moist! Thanks so much, Yelle and yes, it is a lovely moist cake. Thanks Betty. I’m going to try it in the frying pan next time, but if you try it first, let me know how it works out.